Dublin's been amazing. I didn't know what to expect when I landed, but in hindsight I wish I had given it more time. I stayed in yet another dank hostel in a creepy old building, but at least they threw in a meagre breakfast and the location was decent enough. The first night was a bit of a write off, as I got to the hostel as most things were starting to close. I did manage to initiate myself properly by having a liquid dinner (read: a few pints of Guinness) at an Irish pub with some fresh acquaintances. I even walked past a brawl, although I docked points off because it was still so early and it was clearly not a fight between two drunk Irishmen. I had the following day to smash through as many quintessential Dublin things as possible in the space of 12 hours. It started with a trip to the nearby city gallery where they recreated Francis Bacon's dusty decrepit studio down to the smallest detail. In a past life I might have wanted the same sort of chaotic trash pile studio set up, but I think I prefer a little more order nowadays. I then walked to the beautiful Trinity College where I had a short tour of the grounds and bought a ticket to see the Book of Kells. I guess you could say it's Ireland's answer to the Mona Lisa as it's so popular and renowned that people make a pilgrimage just to see it. The book is an illuminated manuscript containing the four gospels of the New Testament - written/illustrated painstakingly on vellum and covered in these extravagant, insane, almost microscopic illuminations in vividly well-preserved colour. The line to get in was huge so I killed some time with lunch sitting in the central park St. Stephen's Green and a quick visit to see some blackened but well-preserved bog bodies at the Archaeology Museum (side note: I think it's nifty that 'archaeology' contains three vowels in a row). Like the Mona Lisa, the Book is pretty small; yet unlike the Mona Lisa I was genuinely floored by the sheer insanity of the book, as well how well preserved it is. (photos aren't allowed) It's just a shame that you can't flip through the thing to marvel at every glorious page for a good few days. 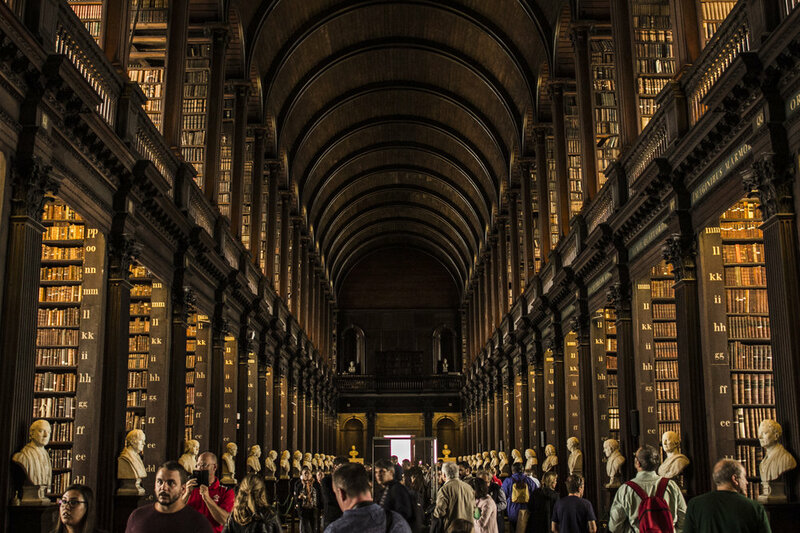 The book is housed in a section of the old Trinity College Library, which is an impressive building in its own right. 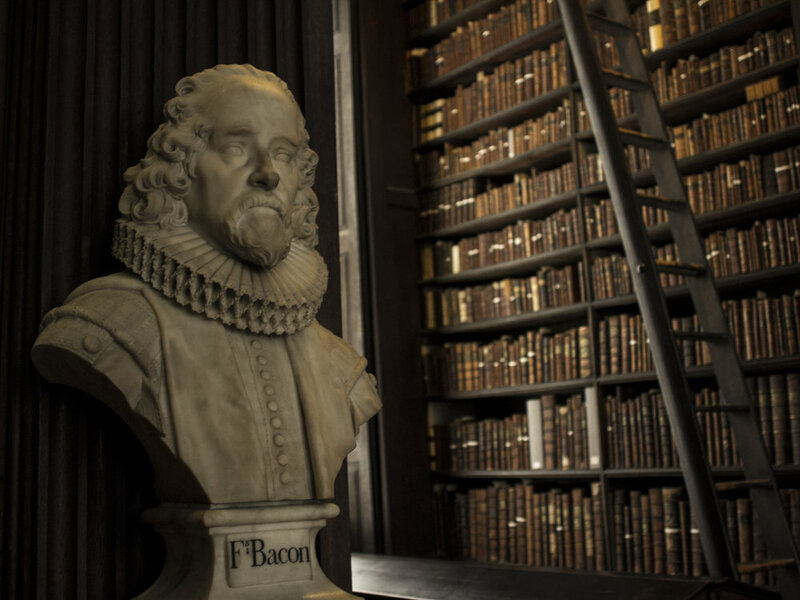 The Long Room especially has that quintessential grandiose old world library feel to it, complete with floor to ceiling shelves of dusty yellowing books, wood panelling on every surface and marble busts of famous writers through the ages. I'm not sure if the Jedi Archives were modelled from it but it definitely sprang to mind, as well as Hogwarts of course. I had planned to go see Dublin Castle afterwards but by then I was sick of paying admission to get inside yet another historical building so I went to go look for a caffeine fix instead. The day's festivities ended with a tour of the Guinness Storehouse. There I learnt the secrets of Ireland's drink of choice and all-round Favourite Thing and enjoyed a complimentary pint at the observatory deck on the top floor. My night would've been free had I not been randomly contacted by Sinead who I used to work with at Stables way back when. We went out for drinks and had a good time catching up. It's always so nice and unexpected when you see a familiar face overseas and being with that person in an unfamiliar environment overrides any potential awkwardness or distance between you.